The colours of moorland landscapes certainly stick in one’s mind but capturing them can be difficult. 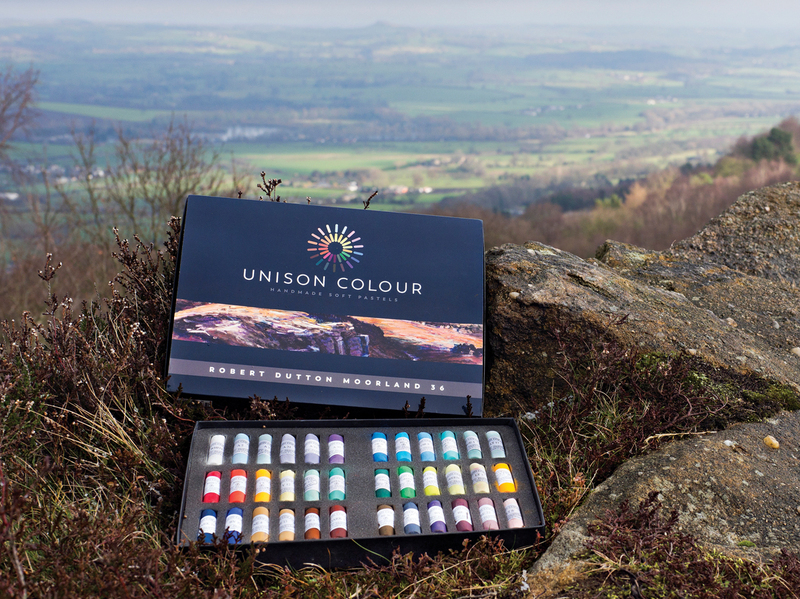 Unison Associative Artist, Robert Dutton has developed an entire set of soft pastels for Unison Pastels so you can enjoy these gorgeous colours taken from the landscape. 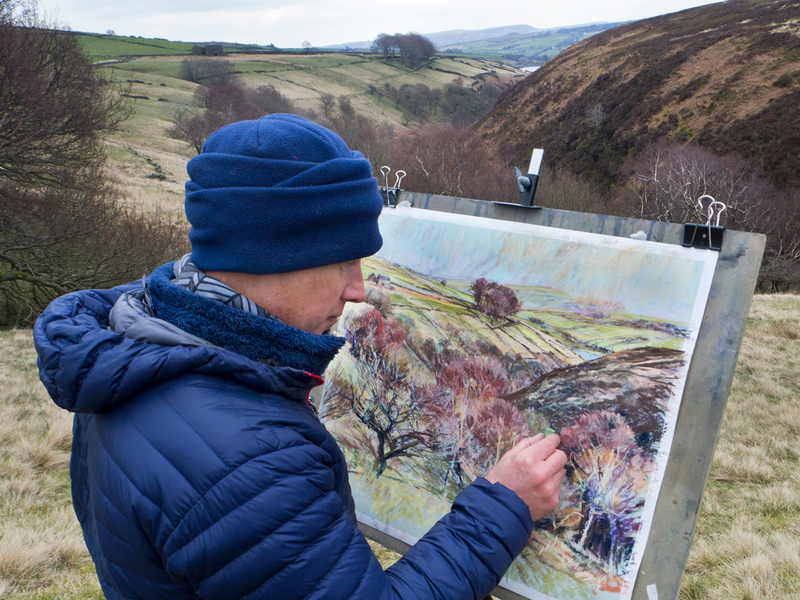 He explains his inspiration for the palette and how to use the individual moorland colours to produce a particular atmosphere. 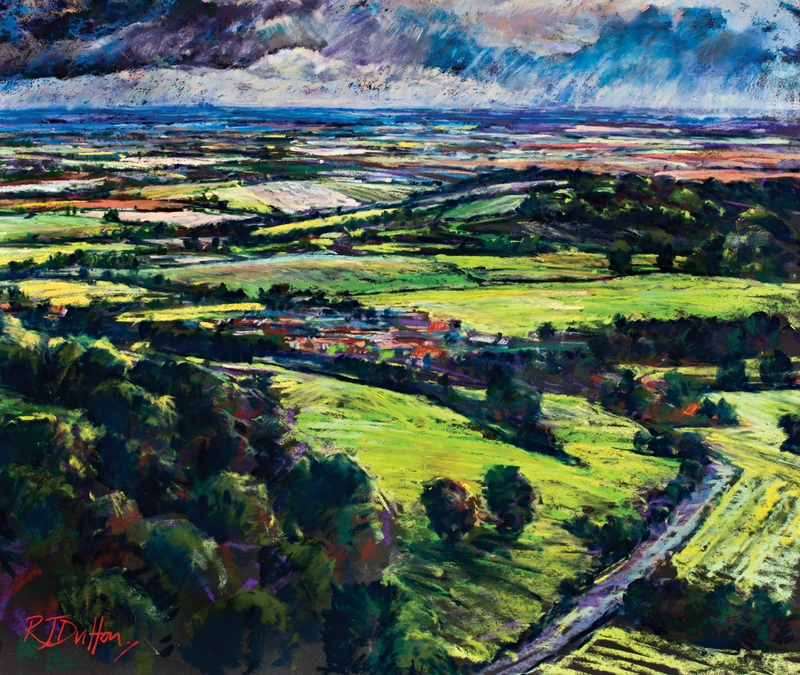 As a professional artist, I feel very lucky to live in ‘Gods own county’ – Yorkshire with inspirational painting locations pretty much on my doorstep and within easy reach of my studio in North Leeds. I am particularly drawn to creating two types of paintings – moody paintings that add a sense of the dramatic or paintings full of energy and colour. The continual changing seasonal character of Yorkshire creates such diversity that whatever the weather the landscape is always inspirational and delivers! 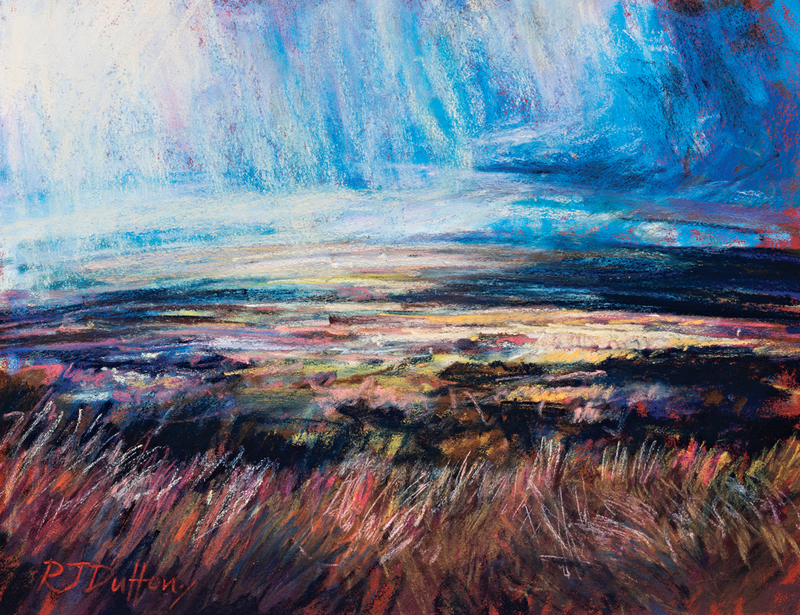 An inspirational vista over the The Vale of York from Sutton Bank, right on the edge of the North York Moors National Park, gave me the perfect opportunity to use the full collection of 36 Moorland Colours using many different pastel techniques from colour mixing, blending and layering for example to depict this energetic scene full of colour and aerial perspective. Colours of particular use from the Moorland Colour box set used to create the visual contrast were Green 34, Yellow 8, BG8, OB7, Dark 18 and BV6. All the colours in the box set are such lovely colours to use every time! I find that colours of Yorkshire throughout the year have the ability to evoke a deep emotion connection to different areas – be they coast, moor, valley or dale. Last light on the moor can create a sense of calm, whilst the energy of the sea invites you to stand in awe and absorbing nature’s beauty in a way that positively energises you. An inspirational landscape setting. Last light on Ilkley moor, West Yorkshire. Unison Colour Moorland Colours created on Canson Mi-Teintes Touch 350 gsm Tobacco (size 50 x 65cm). The Moorland Colour box set features the part of the pastel painting on the high quality printed external banner for the box set. 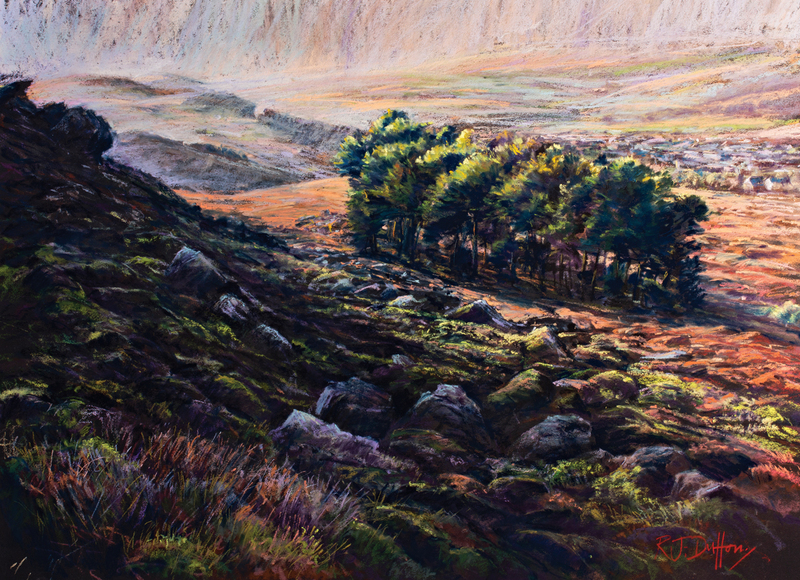 Living in Leeds means I’m close to the South Pennines of Yorkshire in one direction and never far away from my beloved moors of West Yorkshire to escape the vast metropolis and find myself within easy reach of the vastness of Ilkley Moor for example that have inspired artists, poets and writers for centuries and have inspired me to paint these ever changing moorland colours for well over 20 years. There is even a famous song about the moor – ‘On Ilkla Moor Baht ‘at’, the Yorkshire anthem! I’m lucky to have the dramatic Yorkshire coast only an hour and half away by easy roads too. There is much to explore on the coast and creative visually throughout the year too. 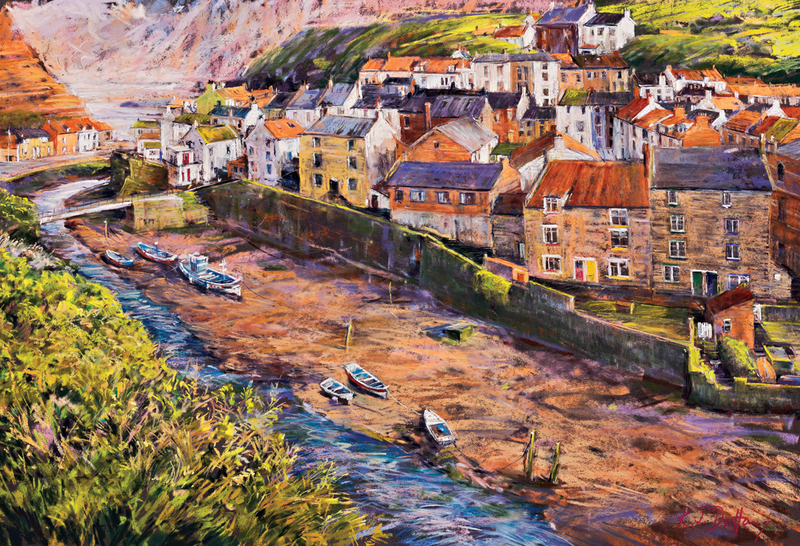 Traditional, historical working fishing towns and pretty coastal villages give me the opportunity to explore a warmer palette of chosen colours. The solitude and special light of a bright Autumn ‘ozone morning’ is really compelling to want to express – particularly with pastels. Pastels o er an immediate response totally necessary as the light doesn’t last long! Starting with a full sheet of black Canson Mi-Teintes Touch pastel paper (50 x 65cm) the lovely sanded surface works in total harmony with Unison Colour soft pastels to express your artistic vision. In this early morning scene with the tide on the turn and coming ever closer to my feet was another reason to work quickly with these lovely soft pastel colours. Plenty of intermixing and layering with the pastels delicately used on their sides was used as well as tips and edges of the soft pastel with more pressured strokes to create the fine details and sharp edges. Colours from the Moorland Set used to express the ozone feel and soft cloud effects were white, A2, A3, A31, A33 OB8, BGE1 and Light 6. For the cliffs the choice of colours were Green 21, Green 23, Green 1, green 34 and dark 18. Colours used for the wet foreground rocks consisted of warmer shades such as NE1, Dark 1, BE24, BV6 and for the highlights and water LT3, LT6 and Blue Violet 12. A versatile range of colours which I’m sure you’ll agree with. Amongst or observing at distance the coastal villages with their cottages clinging to the cliffs, I automatically find myself thinking about the layers of colours needed to recreate the interlocking shapes in terms of pastels shades necessary to capture the scene. Nothing if not spectacular, the wild stretches of coastline less frequently visited in the Autumn and Winter months such as Robin Hoods Bay a little south of the major coastal town of Whitby, inspires me to visit as the light is so special and the beaches quieter when out of season. To evoke that special ‘feel’ and inner connection to this favourite stretch of coastline the Unison Colour Moorland Colour box set is first out of the light rucksack and I’m eager to start working with the lovely hand made colours. With the beach pretty much to myself, the wildness of such a place is truly magical and I’m soon absorbed in what I’m doing and using the colours to connect with the energy and ambience of the coastal landscape. This time the collection of Moorland Colours came with me to the coast. This pastel painting of the soft morning Summer light at the beginning of the day shows how special this collection is to create warmer tones in a pastel painting to evoke a gentle glow and depict the lazy days of Summer holidays! All 36 colours in use but warm shades of Neutral Earth 13 Neutral Earth 4, Yellow 12, Red 9, BE, 22, Light 6, Light 3 in particular were extensively used throughout. Really glows doesn’t it! The vast majority of my work is however, created with pastel. It is the directness of the medium I find so compelling – the way it feels like both drawing and painting at the same time. The medium is incredibly versatile – one minute you can be blending, the next layering with direct contact when applying pastel to the painting support creating a richness and luminosity of colour with speed that is unsurpassed with any other media. 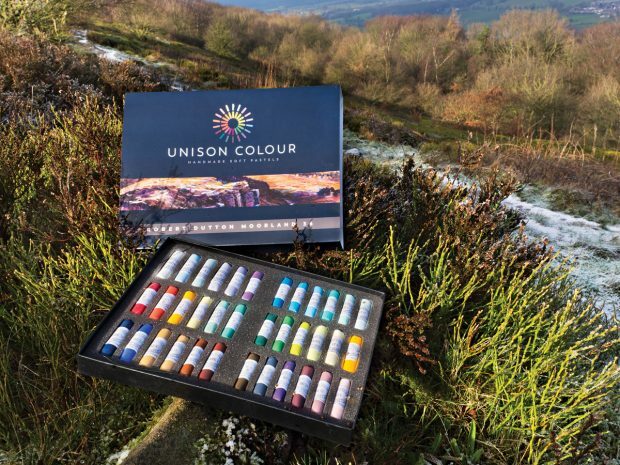 Inspired to share my favourite ‘go to’ Unison Colour pastels with a wider audience to my delight Dan Hersey managing director of Unison Colour was enthusiastic to create a new box set of 36 colours and to market them as the Robert Dutton Moorland Colours collection. the Moorland Colour collection such as BV6, Grey 35, Dark 18, Green 1 and Dark 1 in combination to add drama to the expressive pastel painting. These contrast beautifully to the glowing colours created using colours from the collection such as Orange 4, Green 34, Red 9 and Yellow 12 to name but a few to give the painting its glow. 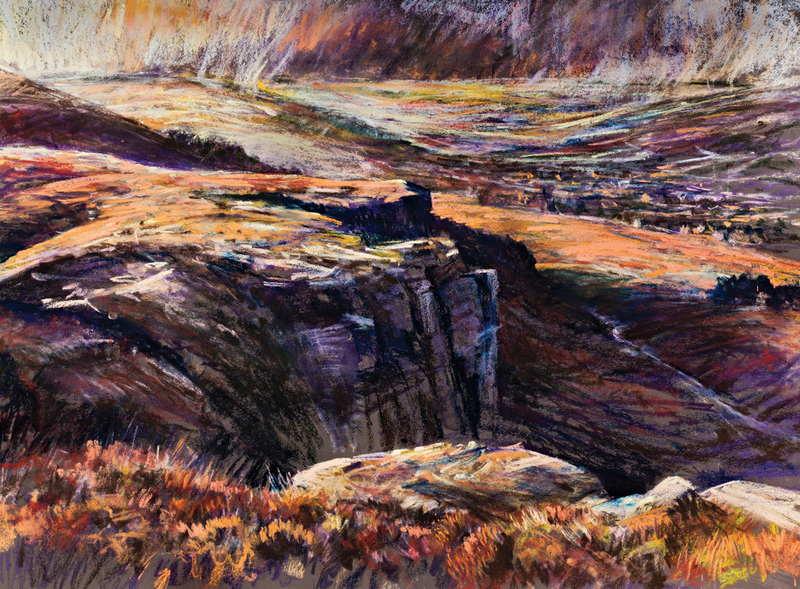 Robert Dutton working directly in the South Pennine landscape using the versatile and easy to use Unison Colour Moorland Colour pastels exploring a variety of creative techniques to express the scene. Lots of techniques are possible with this great choice collection of hand made soft pastel colours. Robert is an award winning professional pastel artist and regular contributor to ‘The Artist’ magazine, a UK Ambassador for Canson Papers and Nitram Charcoal (Canada) and also an Associate artist for Derwent and Unison Colour. A popular tutor, he also teaches very successful art holidays and short art breaks in The Peak District, North Norfolk, The Lake District, France and Spain with places filling quickly. A major contributor recently to a major publication ‘Artists drawing techniques’ published by DK Life, Robert demonstrated his versatility as an artist by taking the lead for the pastel section. The book is now one of their best selling publications. He regularly exhibits with the Federation of British Artists in The pastel Society in London and in 2018 was highly successful with his first entries with the Society of Graphic Fine Artists in London winning ‘best monotone work’ for one of his expressive large scale drawings. major landscape features such as Malham Cove and Gordale Scar for example with their deep limestone cliffs and rock formations are really spectacular and a start contrast to the rolling fields of the rest of the Yorkshire Dales. 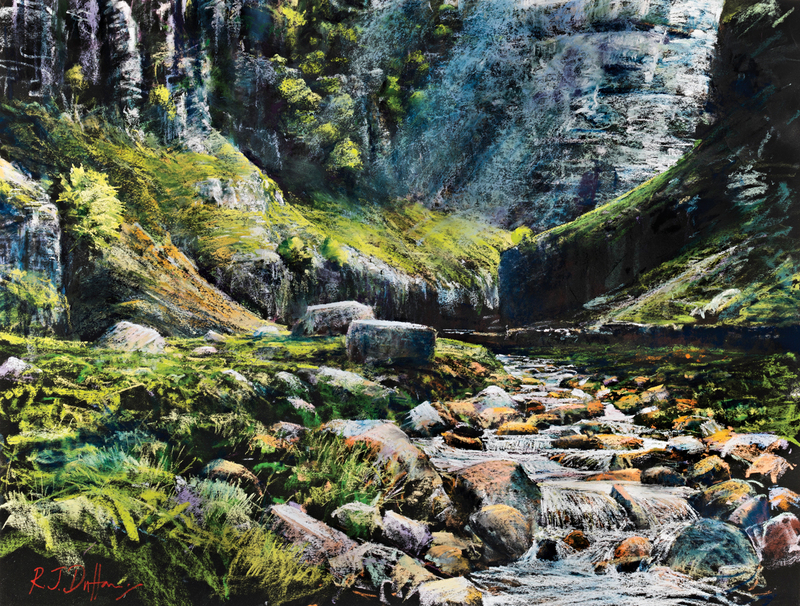 This pastel painting of Gordale Scar and the icy waters of the infant River Aire flowing its way towards the great metropolis of Leeds through Dale and farm, is testament to the power of nature having once been a massive glacier cutting its way through the land to have created such an awe inspiring landscape over millennia. Unison Colour soft pastels from the Moorland colour box set used to create this dramatic scene for the darker tones include Grey 35, Brown Earth 36, Dark 1, dark 18, and for the greens Green 34, Green 1, Green 36, Yellow 12, and for the lighter tones to evoke the ltered morning light and shafts of sunlight BG1 Light 17, A31, LT3 LT6, White and for that special glow in the rocks, Orange 4 and Neutral Earth 13. The full collection of Moorland colours showing how this special collection of colours responds directly to and is in harmony with the landscape from the distant blues and soft greens to the brighter acid greens and warmer tones throughout. A wonderful collection of colours that just keeps on inspiring in all seasons throughout the year. 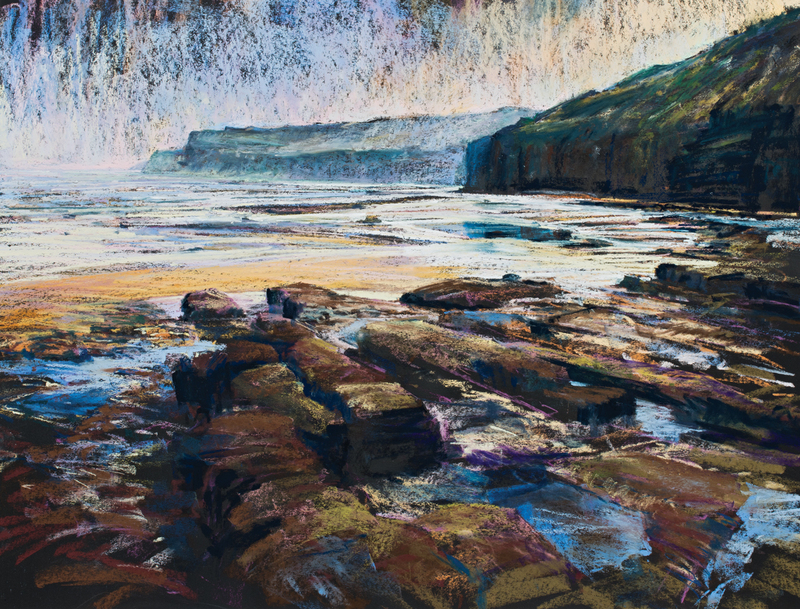 To find out more about Robert and his popular art holidays and award-winning pastel techniques visit his website here. The Unison Colour Moorland Set of 36 colours can be purchased here. You can also view and buy other Unison Associative Artist Sets here. Robert Dutton has also written for us about developing his dark Unison soft pastel colour which you can read about here.